Choose your side. . HD Wallpaper and background images in the Bellatrix Lestrange vs. Bella Swan club. This Bellatrix Lestrange vs. Bella Swan photo might contain portrait, headshot, and closeup. I'm on the same side. Right side! The right side! hmmm......hard question NOT! Go BELLATRIX!!! the Right side!! Left the other one ages ago!! Bella Swan is beautiful, caring, romantic, brave and strong!! But Bellatrix Lestrange could cruico that little brat into oblivion!!!!! This is how a fight would go between them both. Bella: I'm so fast, I can snap your neck off in just a second. Bella: Yea-WAIT! Why can't I touch you? Bellatrix: Cos darling, I use something called a shield charm, stupid! Bella: Well I can read your mind and know what you're going to do.....why can't I read your mind? Bellatrix: Cos I'm really successful at Occlumency. You can't read my mind. Duh! The Dark Lord himself taught me it. Along with all the other Dark Arts. Bella: Oh. Well, guess what?! 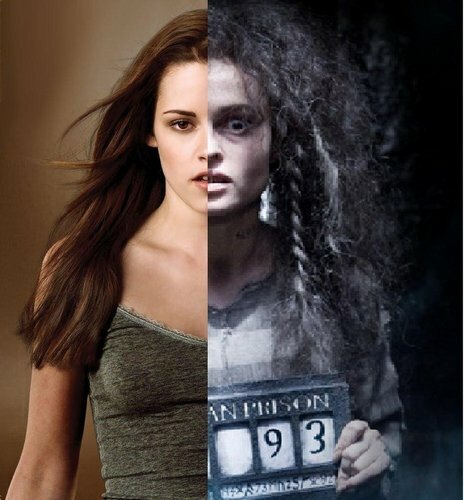 Bellatrix: Avada Kedavra, sweetheart, it's Avada Kedavra. Ok, maybe I can't use the killing curse on you, but I can...do....this! Crucio! Bella: Wha-ARGHHHH!!!! THE PAIN!!!!!!!! OH MY GAWD!!! THE PAAAAIIIIINNN!!!!!!! GOD DAMMIT, SO MUCH PAIN!! Bellatrix: Well I'm a psychotic fighter, my name means female warrior, it's true, I'm unbelievably sadistic and I love playing with my victims before I'm done with them! How about I make you destroy yourself? Imperio! Go and burn yourself. Bella:(walks away to burn herself). Bellatrix: Need some fire....INCENDIO!!!!!!! Incendio!!!!!!!!!!! Bellatrix: I feel a song coming on!.......I KILLED BELLA SWAN! I KILLED BELLA SWAN! AHAHAHAHA!